Happy new year Stone Bakers! Welcome to our first oven of the month of 2018, our winners this time are Louise and Steve Burrows and their Mezzo 76 Kit! 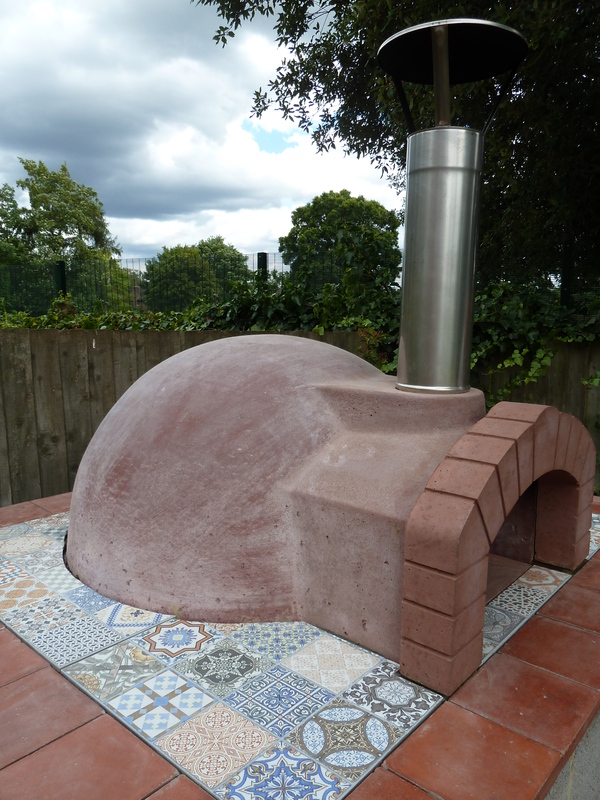 “We spotted the Stone Bake Oven Company following their recipe updates on their website. After trying their delicious Vietnamese beef curry in a conventional oven, I cannot wait to see the taste difference in our new Mezzo 76 self-build kit. 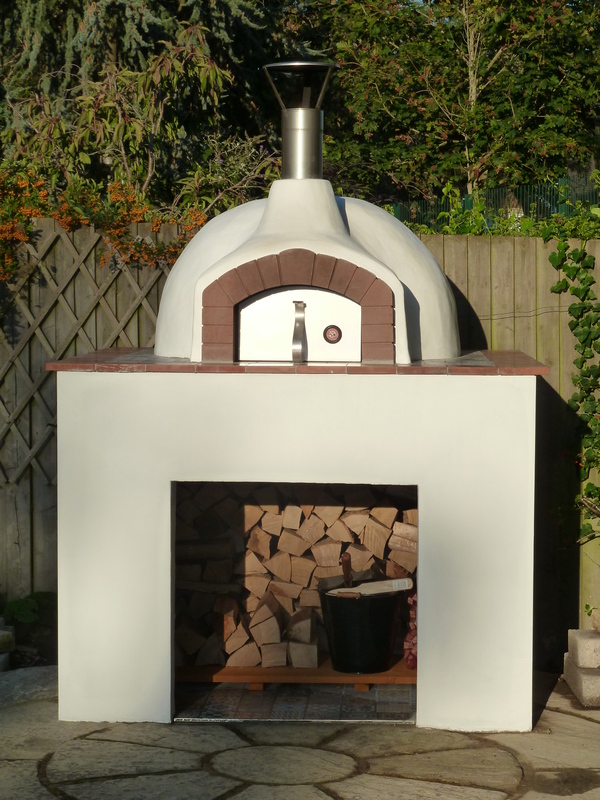 We received our well packed oven mid-summer 2017, dodging the showers completed the oven by the end of August. A dark corner in our garden where a rather rotten, sad looking pagoda, stood on a stone circle was our site. During the build phase, support was quickly provided through the live chat online. 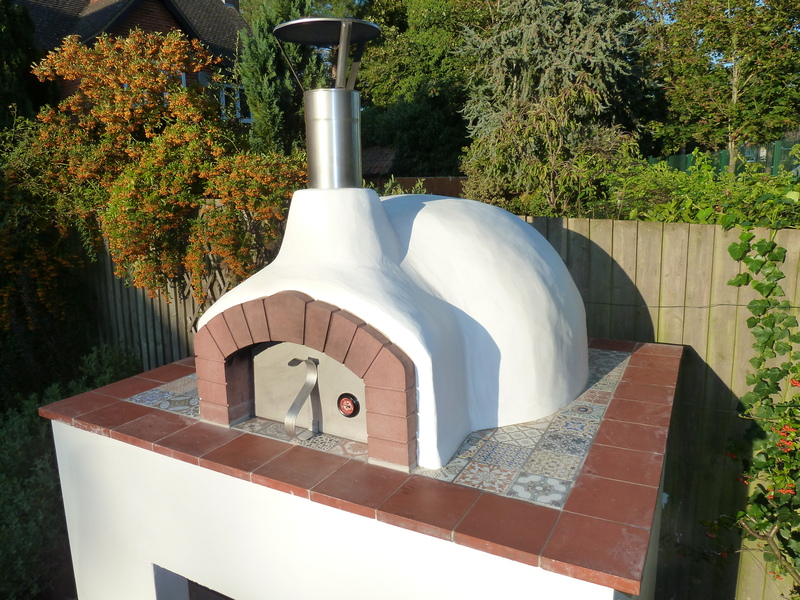 Our builder built a breeze block rendered stand using Stone Bake’s clear instructions as a guide, painted it white and tiled the top in reclaimed 1” thick quarry tiles and exterior porcelain Moroccan style tiles. I love the final finish and think it complements the clean lines of the Oven design. This corner of the garden is now much brighter, even as the autumn comes in; the light reflecting off the stand and oven. The colours reminded my neighbour of being in the Mediterranean! We recycled part of the packing palette the oven arrived in to raise the logs off the floor and tiled the base with leftover tiles to stop the base of the wood store from getting damp. We liked the idea that the Mezzo 76 oven would be insulated to retain heat, as it is our intention to create pizzas as well as slow cooked meats/breads. But also the larger cooking floor means space for multiple dishes/pizzas at the same time. Our second ever firing of the oven was a party for all the neighbours, making pizzas for 20 people. 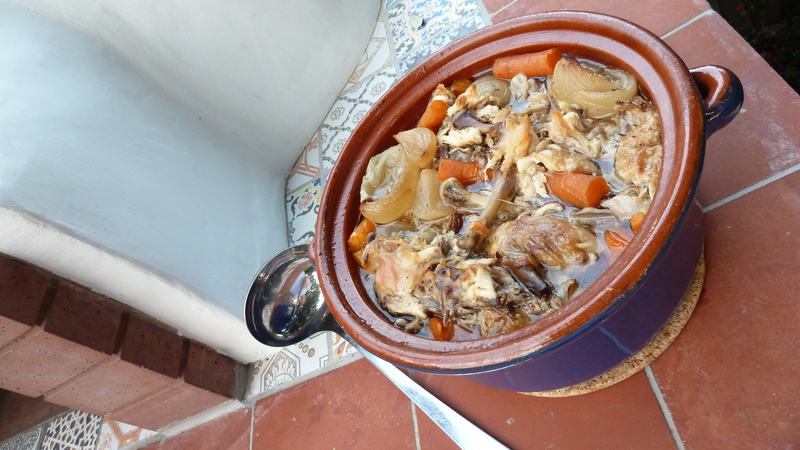 The third firing was a Sunday dinner, I wanted to see how much could be created from one hot oven. Once the oven had fallen to roasting temperature, in went 2 medium chickens with garlic butter under the skin. 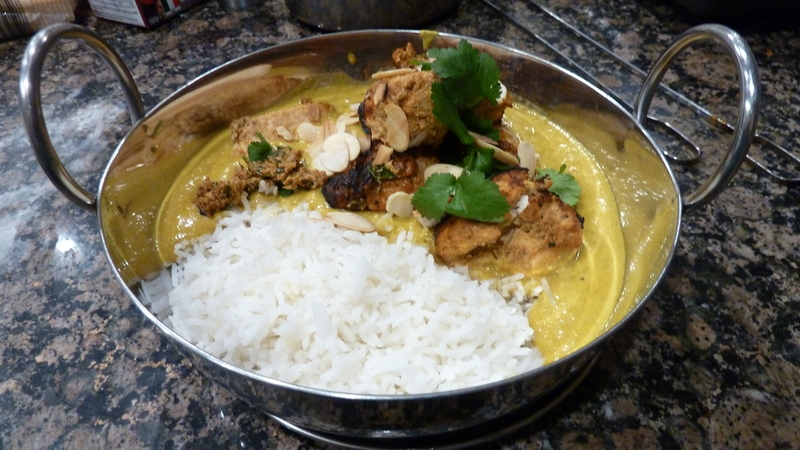 These had beautifully crisp brown skin my guests commented on the subtle slightly smoky flavour. The meat was really succulent too. After the chickens came out, the apple crumble went in- as the embers burnt down, the last of the heat was used by the pot of chicken stock. I was amazed at the amount of retained oven heat, especially as an entire Sunday dinner was cooked on a falling oven, with no extra wood being added to the fire. 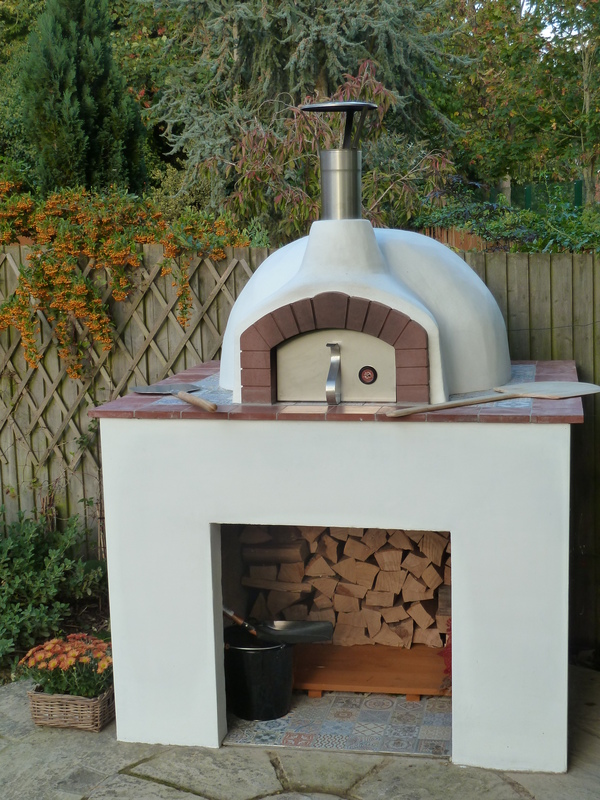 I would definitely recommend going for insulating the walls to increase flexibility in cooking style and longer cooking periods, as the quality of insulation provided by the Stone Bake Oven Company is fantastic; the outer wall feels barely warm even when inside hits over 350 degrees C.
Thank you to Louise & Steve for taking the time to send us over these stunning pictures and such an amazing review.